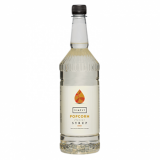 Monin popcorn syrup in a stylish 70cl glass bottle has the taste of the famous snack enjoyed and eaten in the movie theatres and is usually served salted, sweetened, buttered or caramelised. When the corn is heated, pressure builds within the kernel and popcorn is ready to be enjoyed once you hear a small explosion that sounds like a 'pop'! Colour: Gold with slight amber. Taste: Nose itense buttery popcorn. Attack: Strong balanced buttery note. Length in mouth: Well rounded buttery popcorn with light roasted after taste. Flavours associations coffee, chocolate, nuts. Applications: Smoothie, milkshake, latte, dessert toppings, cocktail, mocktail.